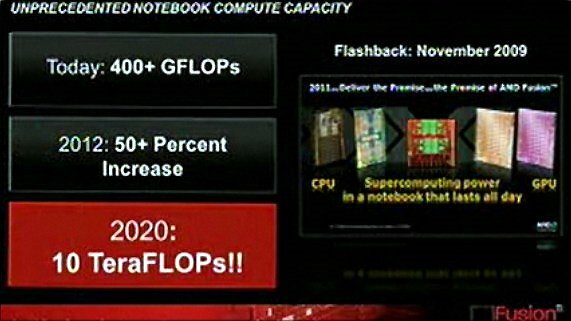 Bright Side of News reports AMD claims it can deliver APUs with a computing power of 10 teraflops by 2020. According to Rick Bergman, looking back to almost 30 years of industry experience, "this is the biggest change in the microprocessor industry". He touted how heterogeneous computing has become important and will dominate the market for the next 10 - 20 years. While now with the launch of the Llano based APUs, AMD offers 400+ GFLOPs in a notebook form factor. In the next year with Trinity, this figure should increase by 50%. By 2020 the company plans to offer 10 TeraFLOPs in the same form factor. Bergman highlights that less than 10 years ago, that was the compute capacity of the fastest supercomputer in the world.